Bulent and I were walking to brunch this weekend. What I like about walking is that in the city there are so many shops to ogle. Clothes, shoes, cheese, olives… The shops are crowded and cheery. Everything is mixed together. The exception it the Balikci’s shop. That is the fishmonger. The shop is usually set away a little because it smells…fishy. 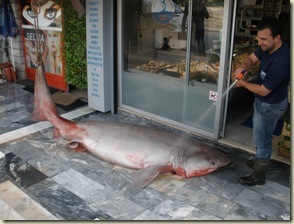 Well, Saturday, as we were walking we noticed that the fish shop was more pungent than usual. As we reached the shop, we found out why. 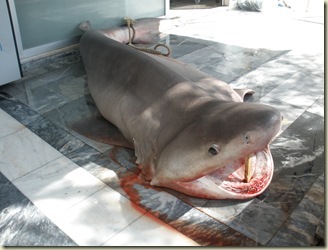 That would be the fishmonger washing blood off a shark with a hose. I had to move back after taking this photo to avoid getting fish blood sprayed on me. Thankfully they did not butcher it as I walked by. However, I think they waited for a while. Because when I walked back from brunch, I passed this. This entry was posted in Expat, Fish, Street, Turkey and tagged Expat, Turkey by Jules. Bookmark the permalink.